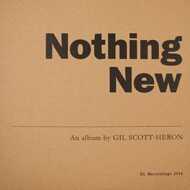 'Nothing New' by Gil Scott-Heron is an album of stripped down vocal and piano versions of songs from his back catalogue, recorded in New York with producer Richard Russell between 2005 and 2009. 'Nothing New' features these stripped down versions of some of Gil's best (though not necessarily best known) songs, as well as excerpts of conversations between takes. The songs were chosen by Gil himself and it was only when compiling the album that Russell realised that each song was taken from a different album, Gil having carefully curated his selection.